*Other Mission Pages: Arizona LDS Missions. *Learn about living in Arizona. 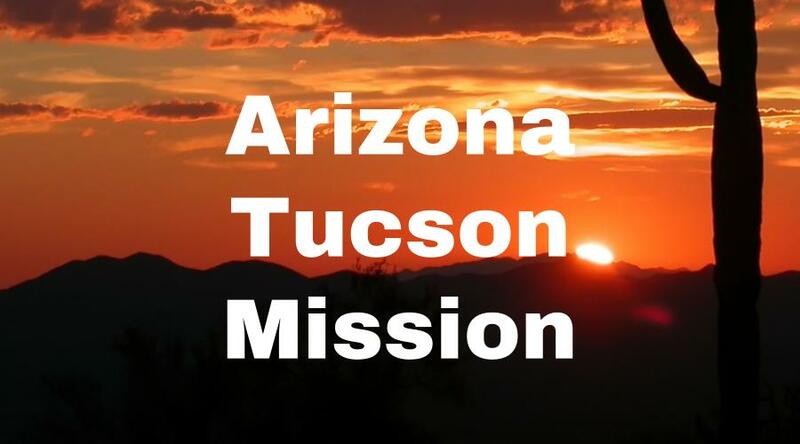 Here’s a recent address for the Arizona Tucson Mission. We try to keep this information up to date, but it’s a good idea to check the mission address with several sources, including your mission packet or the mission office. Here’s a list of LDS missionary blogs for the Tucson Mission. This blog list includes the missionary’s name, URL and when their mission blog was updated. Here are Tucson Mission Groups- for LDS missionary moms, returned missionaries, mission presidents and other alumni of the Tucson Mission. Here are T-shirts for the Arizona Tucson Mission! 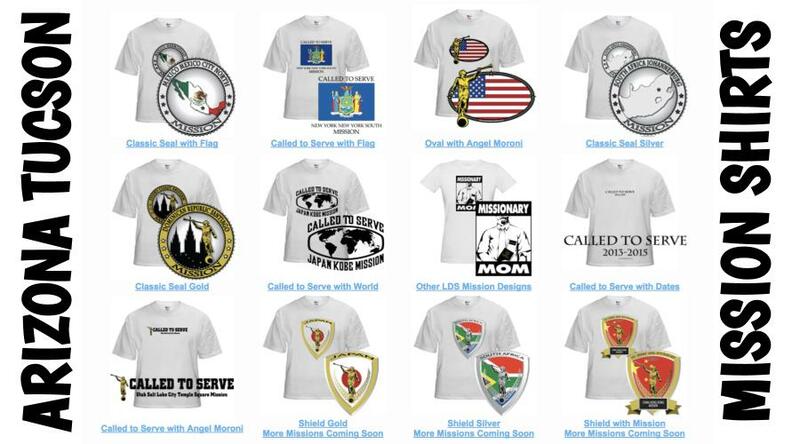 Shirt designs include Arizona Tucson Mission logo/emblem shirts and Called to Serve shirts. The shirts make great gifts for pre-missionaries, returned missionaries and missionaries currently serving. LDS Mission shirts come in all sizes: Small, Medium, Large, Extra Large, up to 4XL. The mission designs are printed on white shirts and are shipped to you. *Simply click on a shirt design to view the details and submit an order. The designs on mission t-shirts may also be printed on other LDS mission gifts, including: Arizona Tucson missionary aprons, Christmas stockings, ties, pillow cases, teddy bears and Christmas ornaments. Here’s a list of current and past Mission Presidents of the Tucson LDS Mission. Here are survey responses from Arizona Tucson RMs, to give you a snapshot into what it’s like to live in the mission. What are some interesting facts about the Tucson mission? Any advice/testimony for pre-missionaries going to Tucson? The Mormon Battalion went through Tuscon and there are 5 or 6 stakes. It goes south to the Mexican border and North up to Thatcher area. With the announcement of the temple it will be one of the only missions with two temples. The mission used to go to El Paso, but about a year before I got into the mission they split the mission so it just goes to New Mexico. The church is really strong and there were about 150-170 missionaries, but now there are about 200+ missionaries. Usually it was about one companionship per ward, but now there are multiple. I was there from 2011 to 2012. The main religion is Catholicism. There are huge Catholic cathedrals down there. There are a lot of Jehovah’s Witnesses as well. Church attendance varies from area to area. My biggest wards were up in the Gila Valley. It depends on where you’re at, but usually at least 75-100 people in each ward that are active. I served in Tuscon and then I went up to the Gila Valley. Tuscon has three languages: English, Spanish, and ASL. There is an ASL church unit in Tuscon. There’s the Gila Valley temple that was built and I got to go once. There are places where Mormons have been for a long time. I think President Benson grew up around there in the Thatcher area. There is a temple announced for Tuscon and there are at least six stakes there. A lot of the members have been there for quite some time so they know the area well. There’s the Mormon Battalion with some history in Tuscon. Raytheon is a big company there so you will meet a lot of engineers that work there. There’s a lot of employees that come from BYU. The members are helpful. There are bobcats and lots of lizards. There are a lot of washes, and when it rains there they have to have places that guide the water. We would ride our bikes through there to find shortcuts. It’s right next to the border so there is a lot of Hispanic influence and a lot of Spanish speaking missionaries. The culture is very mixed. The mission seemed pretty big. It included the southeastern part of Arizona and part of New Mexico as well. Tuscon is almost to the western edge of the mission, but there was an Indian reservation that was more west. It was like a 4 hour drive across the mission. Only English and Spanish were spoken by the missionaries and it was pretty even with the numbers of English to Spanish missionaries. There were like 150 when I first got there. A big influx happened after the age change to well over 200. We had a large number of sisters come in. The first day in the mission we had the opportunity to see a monument to the Mormon Battalion in Tuscon. Their march to California stopped through there. As far as temples, there was one in Gila Valley. It was right on the boundary, and we got the opportunity to go there every 4 months. You really weren’t supposed to go more often than other missionaries were, but sometimes you could get special permission and that was a great experience for me. Another neat experience was during general conference when we learned about the building of the Tuscon temple. The housing for the missionaries was pretty good. I remember not thinking my apartment was pretty nice, but I realize now that it was. It had two bathrooms which was rare. There were some apartments that were even nicer than that. There was one apartment nicknamed the mansion which was a big members house where the member usually wasn’t home and everyone wanted to serve there. For the most part the housing was really nice, a lot better than some other missions I’ve heard about. We had just one set of missionaries to an apartment to try to keep focused. As far as transportation, there are a lot of trucks in the mission instead of cars. I was never fortunate enough to have a car for very long. I was on a bike most of the time. Most of the areas did have cars though. In Arizona there are six missions: Gilbert, Mesa, Phoenix, Tempe, Scottsdale, and Tucson. Tucson is special is one of the few missions in the world that has two temples. When I arrived in the field there were about 150 missionaries, some of whom were sisters, but most were elders. When I returned home, there were about 250 missionaries there with over 75 being sisters. Many areas baptize weekly, and this is because a lot of members are widely varied but friendly. Demographically, the people in the mission vary widely. there are a 2 or 3 reservations, including Douglas and Navajo. There were also a lot of Spanish speakers, a mix of whites and blacks, and others. Most of the wards had a great friendly culture despite any differences. The temperature was mainly 70s-80s year round, unless you went further south. The Tucson mission boundaries started in the South from Safford towards Mexico. Over to the west we went to the U.S. border and the border with Mexico. This included towns like Silver City and Douglas.